SLT-Tech Talk-Interview with CEO for the better to know us. SLT Talk-Interview with SLT-TECH CEO. Still control your LED light by phone? 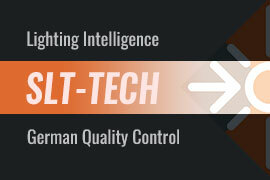 but SLT-TECH lighting can THINK like human. Please Note:This analog video is mainly for the better to let you know SLT-TECH. (M) Question: Mr. Poloczek, can you tell us on what kind of technology your company is working and since when? (M) Question: But how you have done it? Mr. Poloczek: I be more then 30 years in electronic business with a deep understanding of software, electronic components, electronic product design and manufacturing processes, and have had always visions how the future could be, and how products can work if I (we) combine all of this Know-How. (M) Question: And what is the difference to any other manufactures? Mr. Poloczek: As I said, Know-How, understanding of needs, including habbits of people is always our motivation. First we called our products SMART, but found, that many others missuse this word, because they use a software application on a mobile phone to play with their LED lamps. This is total different to our products, because nobody need play on a mobile phone to control our LED products. And, now we call it “INTELIGENT”. Mr. Poloczek: It means, that we have learned a lot of things the past years, and how power supplies and LED’s should work together. 1st. LED’s never like ist hot, so we have to manage this problem and control it, by itself. 2nd. Power supplies work under different temperatures not always stable, and we also have to proof and control it So, with this basic know-how, we manage both of them, the power supply and the LED’s and nobody have to do anything, all it runing by itself. But this is not all, much more things will be done, means control and regulation functions take over the work, that the complete product will work always in a safe stage. Further more we have integrated useful functions with this the customer can customize his LED product, like, dimming timer, light sensor function, system power setting, and more. Mr. Poloczek: OK, this was only for simple understanding, more technical informations will make it complicated. For more informations you can contact us. (M) Question: Is there any other thing to be different? Mr. Poloczek: Yes, I think so. All our products are designed and manufactured by us. We control the quality, from the purchase of components and parts up to the final product, by full testing. Our electronic laboratory is fully equipt from simple Multimeters to an EMI-Shield room, where we can pre-proof engineering samples of electromagnetic interferences.